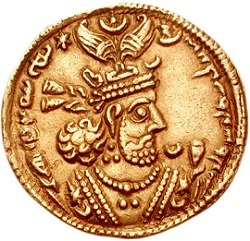 On this date (or very close to it) in 628, the Persian emperor Khosrau* II was put to death by the order of his son and usurper. Chip off the old block, that boy, since he was taking power the same way as Khosrau himself had done way back in 590. But with the old man’s fall, the Sassanid Empire entered its death spiral: by 651, it would be overwhelmed by the armies of Islam. Little could the younger Khosrau have conceived of his glorious Persian state laid low by these desert zealots! Persia’s last great pre-Muslim empire flourished in Khosrau’s heyday. Briefly deposed in his youth, Khosrau reinstated himself with the aid of the Byzantines — ironic aid, in retrospect. After his Constantinople angel Emperor Maurice was deposed and slain in 602, Khosrau availed the pretext of vengeance to make war on Byzantium. The fall of the Sassanids, and Khosrau, from this apex was precipitous and entire. The Byzantines under Heraclius rallied dramatically and in the winter of 627-628 carried Roman arms to the city of Dastagerd, just a short march from the Sassanid capital Ctesiphon. The intrepidity of the counterattack threw the Sassanids into a commotion; Khosrau disgracefully fled Ctesiphon, and in the power vacuum that followed, his heir Kavadh seized power. A usurper cannot afford to found his authority on sentiment; Kavadh not only had his father executed — allegedly by being shot slowly with arrows — but he ordered the deaths of all his half-brothers to extinguish as many future rivals as possible. The precautions did not grant Kavadh a long reign: he died of the plague later that same year, beginning a dismal progression of feeble claimants overthrowing one another. The Arabs overran Ctesiphon by 636, leaving the rump of the Sassanid state shrinking towards nothingness, and its last emperor to be ignominiously slain by a miller. The BBC In Our Time podcast has an enjoyable 2011 episode on the Sassanids available here. * Also rendered Chosrou or Chosroes, among many others. Perhaps Byzantium’s most anathematized emperor — one Byzantine historian elided his whole 8-year reign because “speaking of suffering is itself suffering” — Phocas’s own rise to the purple owed itself to extrajudicial executions. That gentleman was a mere army officer of no regal proximity during the previous emperor’s campaigns to ward off the incursions of the Slavs and Avars into the Balkans. While this campaign on the whole enjoyed its successes, Phocas enters the historical scene about 600 as the leader of a delegation sent from the legions to Constantinople to object when the cash-poor imperial court refused to pony up ransom money for comrade soldiers taken prisoner. Phocas was abused at court, and the Avars executed their hostages. By 602 the policy of having the soldiery take it in the braccae (soldiers’ own allotments had also been pinched by the same budget strictures) blew back when the foul-tempered army was ordered to winter on the far side of the remote Danube. The government collapsed in the face of a military mutiny; Phocas was crowned emperor; and he executed the former emperor Maurice, plus Maurice’s six sons. Much as we are accustomed to think of the old Roman emperors ever on the edge of violent overthrow, this event was for its contemporaries a great novelty and a dangerous precedent. There had not been a regime change by coup d’etat in Constantinople since that city’s namesake set it up as his capital nearly three centuries before. Erected in gratitude by the Exarch of Ravenna. Phocas’s reign, however, was defined by war with the Persians. And it was in the time of Phocas that King Khosrau, who actually owed his throne to previous Roman support, started breaking through the weakened Byzantine frontiers and tearing off huge pieces of territory. By the last years of Phocas the Persians had taken Upper Mesopotamia and Armenia, and begun pressing into Anatolia where resistance collapsed with frightful ease. A Persian raid reached as far as Chalcedon in 608. There’s just something about having an enemy army in the suburbs of your capital that tends to overwhelm the value of any goodwill you got from cozying up to the pope. In that same year (and this was surely a factor in the Persians’ shocking penetration into Anatolia) the Exarch of Africa began a revolt against the former centurion wearing the purple. From his position he was able to cut off grain shipments to the capital from the empire’s breadbasket, Egypt, which put Phocas in a truly desperate position. This exarch’s name was Heraclius but it was the man’s son, also named Heraclius, who would do the usurping. Approaching the capital in 610, the Heraclii were able to quickly gather allies. Even the Excubitors, Constantinople’s Praetorian Guards under the leadership here of Phocas’s own son-in-law, saw where the winds were blowing and deserted immediately. The rebels took Constantinople without a fight, and two patricians seized Phocas and presented him to the new sovereign. Heraclius wasn’t in in the mood to be upstaged by his doomed predecessor, and got the latter’s execution, together with his own immediate coronation, enacted straighaway. 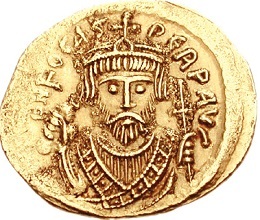 Phocas’s reputation did not profit from the comparison, and for Heraclius the last guy made a convenient foil to whom every evil of the realm could be attributed. We know Phocas almost exclusively through the accounts of later historians dating to this period, which is undoubtedly a factor in the black name our principal enjoys all the way to the present. The excellent History of Byzantium podcast attempts a balanced portrait of this era in an episode aptly named “In Fairness to Phocas”. 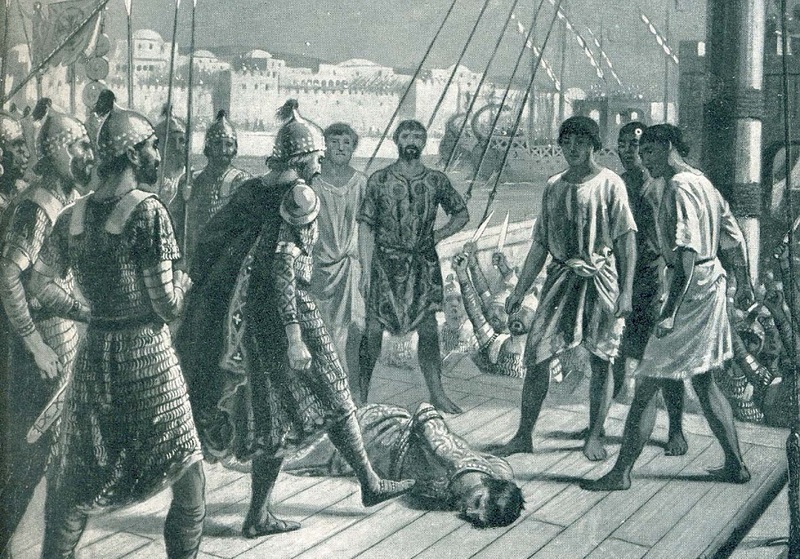 The subsequent episode, “Heraclius to the Rescue”, deals with Phocas’s unpleasant exit from the scene. * The new emperor personally executing his rival had a Roman precedent. ** Other Phocas achievement: he re-introduced the beard onto the imperial fashion scene. His predecessors had almost universally gone for the clean-cut look.